If your ambitions are overwhelmingly high, but a current shopping cart refuses to keep it up with you, we’re always here to offer our help. Once and again, Cart2Cart enriches the number of platforms available for migration by establishing the support of Cart66 - WordPress e-Commerce plugin! 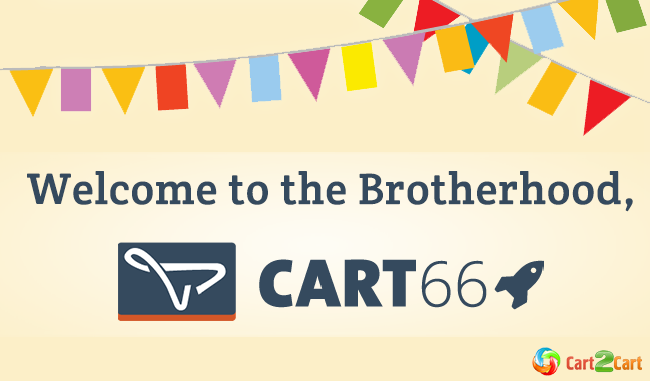 From now on, nothing can stand between you and your well-deserved success, as data transfer from Cart66 to one of 60+ most popular platforms has become easier than even before. Though Cart66 is a fairly good e-solution that successfully copes with the needs of thousands of merchants, its users’ demand for switch to other platforms is getting increasingly high. Consequently, Cart2Cart has started offering the possibility of automated transfer from Cart66 to a great number of other solutions in terms of hours. Experience the benefits of world’s top e-Commerce platforms by performing an effortless and swift transfer of your products, categories, customers, orders and other entities in a few simple steps! Thanks to the simplicity of migration with Cart2Cart, you can perform a full-scale switch from Cart66 with no programing skills required! Check out how your brand new store will look like with absolutely free Demo Migration!